Why, my soul, are you downcast? Why so disturbed within me? Put your hope in God, for I will yet praise him, my Savior and my God. My soul is downcast within me; therefore I will remember you. Last week, while selecting some avocados in the produce aisle, I heard a loud gasp which caused my attention to be diverted to a woman who had just started an avalanche of sorts over by the oranges. As she restacked the fruit I distinctly heard her mutter, “Stupid girl! How could you be so clumsy?” In that moment I imagined her as a five year old child being berated by her mother, in the same tone, for the same offense. From an early age, I remember learning that spoken words have power, both to hurt and to heal. My mom taught me to use the words that came out of my mouth with care, particularly when they were directed towards others. What I did not understand then was that the way we talk to ourselves can have just as much power to transform our minds—in both good and bad ways. In the first testament, the Bible contains an historical timeline of accounts surrounding King David, beginning in his childhood and culminating with his death. David, like you and I, encountered some great highs and some equally low lows. In today’s Scripture, we find David battling with what I believe to be borderline depression. He was tired of being chased by his enemies, tired of being misunderstood, and likely tired of waiting for God’s promises to come to fruition. Can you relate? Buried in the words of Psalm 42 is a valuable lesson on self-speak that we would do well to put into practice. David knows he’s feeling particularly low. So he wisely acknowledges and labels his feelings. But then David uses the power of his own words to construct a ladder which he uses to climb his downcast spirit out of the pit of despair he’s found himself in. RECOLLECTION: Lastly, David takes a decisive walk down memory lane when he declares, “therefore I will remember you”—which I am sure brought him back to thoughts of himself as a boy killing a lion and then the giant, Goliath, and having escaped from the tip of Saul’s spear a time, or three. Do you feel in a state of despair today? Have you been passively listening to (and agreeing with) all the negative self-talk that comes along with it? Do not lose heart—USE YOUR WORDS! 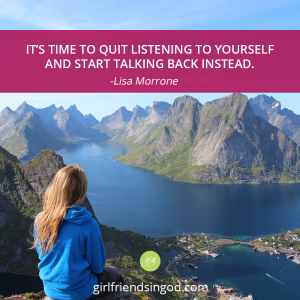 It’s time you quit listening to yourself, and start talking back to yourself instead. Speak out transformative words of hope and praise. Remind yourself aloud who your Lord is and recount the many times He has redeemed your circumstances, been true to His promises, and shown His kindness towards you. My Creator and my God, You have formed and fashioned my heart (emotions), my mind (thoughts), and my tongue (words). Enable me to apply today’s instruction in a way that will lift up my downcast spirit and allow me to emerge with my eyes fixed firmly on You. In Your mighty Name, Jesus, I pray. Now It’s Your Turn: David used positive self-speak to transform his downcast heart to an uplifted face. The next time you are faced with an unsettling emotion, name it, and then place your hope firmly in Christ and offer Him words of praise. Declare His authority over your life and your circumstances. Finally, remind yourself of His steadfast love and provision in your past, which will bring you full circle, right back to hope! Sleep Well Again (Harvest House Publishers) is one of Lisa’s six books in her Restoring Your Temple® health resource collection. Her books are available on Amazon.com, barnesandnoble.com, or wherever books are sold. Lisa Morrone, PT is a physical therapist, professor, author of six books, radio guest and event speaker who encourages people to “Get Healthy for Heaven’s Sake.” Visit Lisa’s website for more information and to sign up to receive her informative “Monday Morning Health Tips”! Words we speak over ourselves are important. Maybe, even more so than others. we can cancel the verbal abuse out with what God says. Rebecca, God’s words about us can back fill holes in our hearts that we, ourselves, or others have dug–that’s for sure! Resounding “YEAH!!! !” and 10 fist pumps!!! To God be the Glory!!! I needed this, Lisa. Thank you!!! Yay, Beth! Fist pumping right along with you! Thanks Again, Marie!!! Ahhh I can breathe! To your God, Jehovah be the Glory!!!!! May he continue to be your daily “motivation”, the Drive!!! So glad my devotional has cleared your “spiritual lungs”! Now continue to live and breathe in HIM! Joel Osteen spoke yesterday about Healing words and today i read about words again. God is speaking ti me through you. Felt so identifies. Thanks and God bless! Misty–God always means to get our attention when we hear from him multiple times over on the same subject! Wow. This is exactly what I needed to hear! I am still young, but when I was in my awkward teenage years, I beat myself up with my words. I would tell myself I was stupid for making the decisions I had made, and that I was ugly and not worth being here. Then after a few years of this, God spoke to me in a message I heard preached one night and He let me know that it was time to get free of this depression. So I went to the altar and gave it to God! I can’t say that it doesn’t come back and try to latch onto me again, but the Bible says that we are more than conquerors through Him that loved us! I would appreciate your prayers as I continue in this fight! Chloe, I love the sound of victory in your words! The fight continues for us all, but we are on the side of victory, of that we can be sure. Father, there are some parts of my story I would rather have been left out. But I know that You can turn a bad story into a good purpose. Give me the courage to tell others about how you have healed my broken places, especially the ones that have been wrought by my own decisions. In Jesus’ Name, Amen.